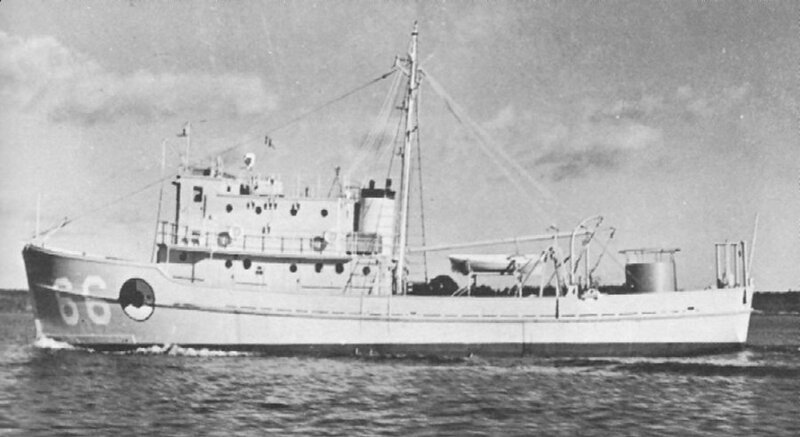 Accentor Class Coastal Minesweeper: Laid down 8 May 1941 as Bulwark by the Bristol Yacht Building Co., South Bristol, ME; Renamed Avenge 17 May 1941; Launched, 14 February 1942; Placed in service as USS Avenge (AMc 66), 2 April 1942 at the Boston Navy Yard; Placed out of service, 14 December 1945 at Charleston, SC; Struck from the Naval Register, 8 January 1946; Transferred to the Maritime Commission 8 August 1946 and sold to United Fisheries Co. of Gloucester, MA. Fate unknown. Specifications: Displacement 195 t.; Length 97' 1"; Beam 22'; Draft 9' 1"; Speed 10 kts. ; Complement 17; Armament two .50 cal. machine guns; Propulsion one 400bhp Atlas 6HM-2124 diesel engine, one shaft.